First there was the baguette bakery in the office-building lobby. Then came a takeout window dispensing organic chicken broth in coffee cups at Marco Canora’s Hearth. 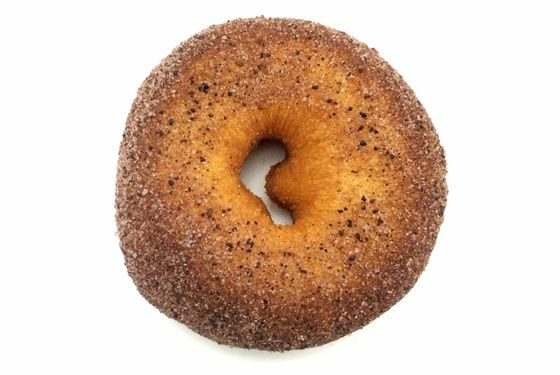 And now the trend toward sticking purveyors of delicious foodstuffs in unlikely settings continues with the opening next week of Underwest Donuts, a nifty little operation wedged into the hallway of the Westside Highway Car Wash on Twelfth Avenue across from the West Side Highway. 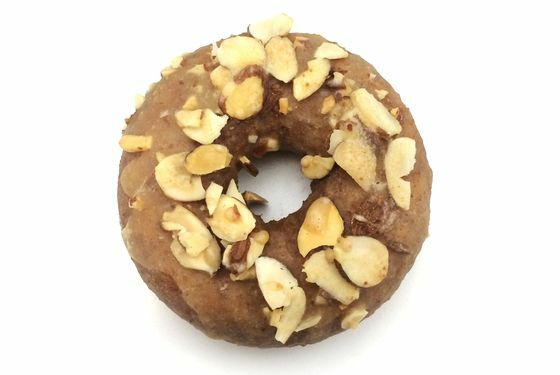 * The doughnuts are not the work of a moonlighting member of the car wash crew but of a former Chanterelle sous chef named Scott Levine. 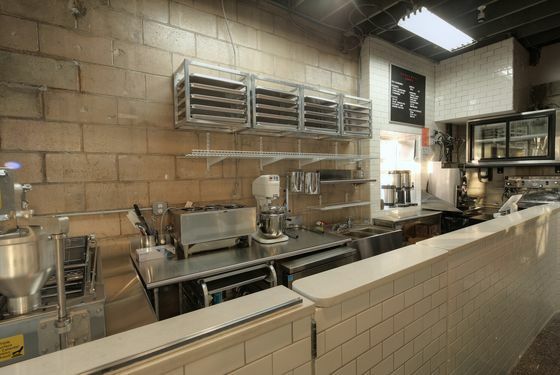 Levine, who’s also worked the savory side of the kitchen at Union Square Events, confesses to being a pastry obsessive trapped in the body of a savory chef. “I have a massive sweet tooth,” he says. “And there were times during my career when I thought to myself, I don’t know why I’m in the savory kitchen.” When the opportunity arose for him to follow his bliss, he seized it. But why a car wash? Because “it’s quintessential Americana; it’s fun and nostalgic, and you know, serving coffee and doughnuts in a car wash seemed to be such a great marriage.” There’s also the fact that Levine’s father-in-law is one of the owners of the place, and that there was an unused spot in the passageway opposite the car-wash tunnel just waiting for someone to install a Belshaw Adamatic Donut Robot — the same kind of Rube Goldberg machine they use at Dreesen’s in East Hampton. So now, as your Subaru is tugged along the car-wash-conveyor track, you can watch Levine run your doughnuts through the Donut Robot. The sinkers come in three categories, all of them cake-style, including glazed, sugared, and old-fashioned (i.e., plain). And while Levine’s flavors are not the kind you would classify as over-the-top, they show a creative influence honed during an early career stint at Jon Snyder’s Il Laboratorio del Gelato, where Levine developed a fondness for the black sesame and honey lavender gelati. 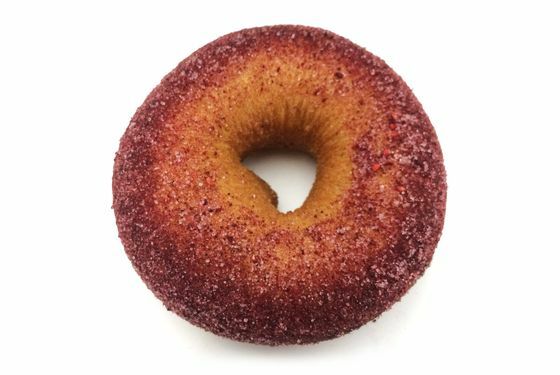 There’s a coco-rasperry sugar doughnut, for instance, a rich brown-butter number, and a why-hasn’t-anyone-thought-of-this-before? 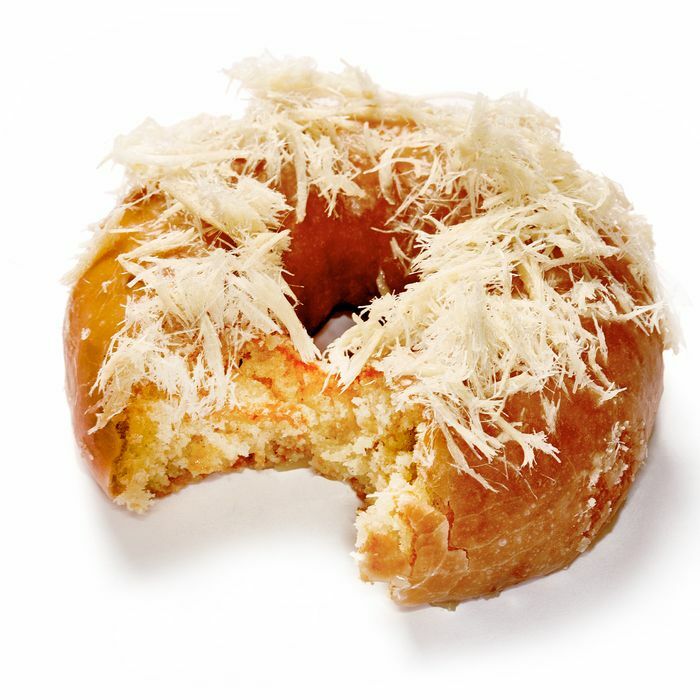 halva doughnut, made with tahini and halva in the batter and topped with shredded halva that has the intriguing texture of slightly hardened cotton candy. To wash it down, there’s Brooklyn Roasting Company coffee and espresso drinks. And if you like lingering in West Side Highway car washes, you can do it at one of six counter stools near the retail racks of Prestone antifreeze, Super Power coconut air-freshener sheets, and those beaded seat cushions taxi drivers swear by. Underwest Donuts, at Westside Highway Car Wash, 638 W. 47th St., at Twelfth Ave.; 212-317-2359. 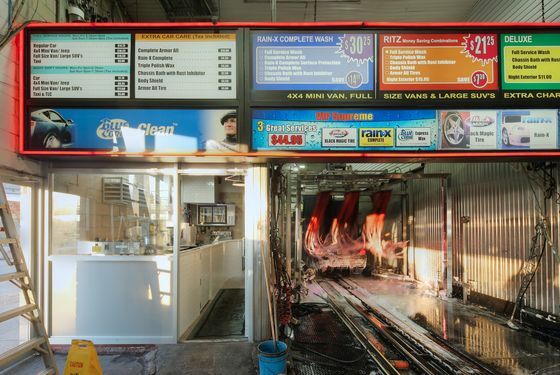 *This post has been corrected to show that the car wash’s name is Westside Highway Car Wash and that Levine was a sous chef at Chanterelle, not an executive sous chef.